1. Prepare a bacterial smear slide (Find protocol at Preparing a Bacterial Smear Slide). Use the staining trays and sink area. Be sure you evenly cover all the smears on the slide throughout this procedure. 2. Cover the smears completely with any aniline dye solution (most often methylene blue, basic fuchsin, or crystal violet) and stain for 1 minute. Do not use more stain than you need. 3. 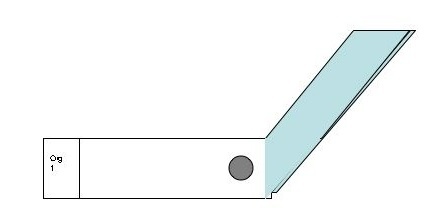 Tilt the slide at a 45 degree angle (wear gloves or use a slide holder or clothes pin). Rinse the slide in a very gentle stream of water from your water bottle. Direct the stream above the top smear. 4. Drain off excess water by touching the edge of the slide to a paper towel. This staining procedure is used to classify bacteria. It is one of the most common and useful tools in identifying bacteria in the microbiology laboratory. Gram-positive and Gram-negative bacteria are both stained purple by the crystal violet (primary) stain. Addition of the iodine leads to the formation of a crystal violet-iodine complex within the cell wall. The decolorizer extracts lipid from the cell wall of Gram-negative bacteria, so the crystal violet-iodine complex diffuses from these cells and loses color. The crystal violet-iodine complex remains within the Gram-positive bacteria because their cell walls lack the lipid-rich outer membrane of Gram-negative bacteria. Due to the increase in porosity of the Gram negative cells after lipid loss from decolorization, safranin (counterstain) is able to permeate the cell wall of Gram-negative bacteria. Purple (primary stain retaining) indicates Gram positive and red (counter stain uptake) indicates Gram negative. Some organisms and dead or dying cells do not take up or lose the stain appropriately and can not be classified as either Gram positive or Gram negative. 1. Place your smear on the staining tray. It is important that the slide be level during staining so use paper towels under the tray to get it leveled. If you do, it is much easier to prevent dye from running off the slide during the staining process and to be sure that your smears are evenly covered with each reagent. 3. 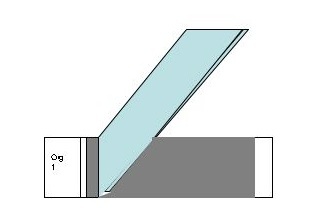 Rinse the slide by lifting it at a 45 degree angle (using gloves or a clothes pin or slide holder) in a very gentle stream of water that is directed above the top smear until the waste water coming off the bottom is relatively clear; drain off excess water by touching the edge of the slide to a paper towel. 4. Dispense just enough Gram's Iodine (mordant)to completely cover each smear. Let stand for 1 minute, and rinse thoroughly with a gentle stream of water as in Step 1. 5. Place the slide flat on the staining tray and dispense just enough decolorizing Reagent (80% isopropyl alcohol, 20% acetone) to completely cover each smear. Let stand for exactly 10 seconds and IMMEDIATELY rinse in a very gentle stream of water that is directed above the top smear as in step 3. This step is tricky as it is easy to over- or under-decolorize. 6. Place the slide flat on the staining tray and dispense just enough Counterstain Solution (0.6% safranin in 20% ethanol) to cover each smear. Let stand for 1 minute; rinse with water as in step 3. 7. Blot dry using the bibulous paper package found in your orange drawer. Do not tear out the pages, just insert your slide and pat it dry. 9. Observe your stained microbes microscopically following carefully the procedure for using the the oil immersion objective on your compound brightfield microscope BISC209/S12: Microscopy described in the protocol page. A capsule is a gelatinous, slimy, carbohydrate material surrounding the bacterial cell. The capsule has many functions including, preventing dessication, aiding in biofilm formation and adherence to a surface or to another bacterium, and protecting the cell against phagocytosis which makes parasitic organisms more resistant to a host's natural defenses and free living bacterium less likely to be engulfed by a predator. Sometimes it is helpful to determine cell morphology and cellular arrangement of a bacterium without the damage associated with heat fixing a smear. A staining technique, called negative staining, is frequently used because it outlines a bacterium against a dark background field. The bacterium will appear clear (unstained). The background dye doesn't stain the organism because its acidic chromagen is repelled by the negative charge on the bacterial cell surface. In a capsule stain, the negative background stain is combined with a positive stain that dyes the cytoplasm of the bacterial cell. This composite stain is useful when you are trying to observe both the cell morphology and the presence of a capsule around the cell. Sometimes the desired organism is washed away by the application and rinsing of the positive dye, but when the procedure works, both the stained bacterium and the clear capsular zone are quite beautiful. Positive stains alone can sometimes demonstrate capsules, but capsules are clearer when negative stains are employed. In this procedure a negative stain, such as India ink, creates a dark particulate background in which the capsules show up as clear areas surrounding the purple positively stained cell. Because capsule production is sometimes dependent on many factors, staining an older culture, particularly one that is slimy, is a good idea if you believe your organism has a capsule. You will need 1 clean slide for each bacterial isolate you wish to examine. Aseptically transfer a barely visible amount of bacteria from a colony or slant culture to the mixed drop and mix gently, again, without spreading. 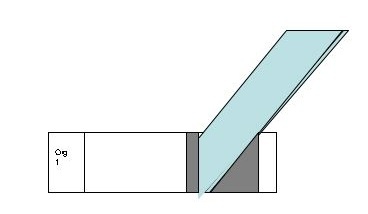 Take a second slide and hold the short side of the slide next to the drop at a slight angle. Push the opposite short edge of the slide through the drop to spread it along the whole length of slide in one smooth motion. Discard the slide used for spreading in the biohazard bag in the plastic bucket on your bench since it is contaminated. Allow the slide with the smeared nigrosin and culture to air dry. DO NOT HEAT FIX OR BLOT THIS SLIDE. Place a drop of oil on a section of the dried slide that is somewhat dark, but not opaque. Examine the slide with the microscope, looking for large clear circles around a bacterium. Not all bacteria will have a capsule and even those that do, may not produce it when in exponential growth phase. Endospores are structures that are formed under adverse environmental conditions by certain Gram positive bacterial species such as Bacillus and Clostridium. Forming an endospore enables the organism to survive harsh environments, including lack of nutrients and moisture; thus, an endospore can remain viable for hundreds of thousands of years in dust or soil or in just about any environment. Endospores are the most resistant form of life known. Their presence in dust explains why Bacillus species are common laboratory contaminants. Their very thick spore wall is not easily penetrated by dyes, so they will appear, when Gram stained, as unstained areas within the cells. Malachite Green, when combined and heat, is driven into the spores. Counterstaining with safranin stains the vegetative cell pink/red. The ability to produce spores and the spores' location and size in the cell are characteristics used to differentiate some bacterial species. Please only perform the spore stain during scheduled lab time. Prepare a bacterial smear slide and heat fix it. (Find protocol at Preparing a Bacterial Smear Slide). Take your heat fixed smear slide to the hot plate on the fume hood. Tear off a small piece of paper towel so it is smaller than the width and length of the slide but big enough to cover the area of the smears. If you have 3 smears on one slide, cover all 3 with one piece of toweling. Be sure the pieces of paper towel pieces don't overhang the slide surface. Using a Pasteur pipet, apply enough malachite green primary stain to evenly cover the paper towel, making sure the toweling looks wet but there is no excess dye pooling on top of the paper toweling. Try to avoid using excess. You will need to carefully monitor the dampness of the toweling, applying 1-2 drops more malachite green to the paper towel area(s) as the dye evaporates only if the paper toweling looks VERY DRY. Watch for steaming of the stain (a desirable outcome). Steaming is crucial! Keep the paper toweling moist with stain and the slide steaming for 3 minutes. Use a clothes pin to remove the slide from the heat, and CAREFULLY place the hot slide onto a nearby clean paper towel. Do not burn yourself. Allow the slide to cool. Use forcepts to remove the little piece(s) of paper towel from the smear and discard them in the trash (not the sink). Rinse the smears forcefully with water into your staining tray until the water stream runs clear and any remaining paper toweling is removed. Place the slide on your stain tray and flood the slide with safranin counterstain (from your Gram stain kit). Let it sit for 30 seconds. Rinse again with a stream of water and blot the slide dry using Bibulous paper. Observe your stained smear(s) using the microscope at 1,000x magnification (using immersion oil). FOLLOW THE DIRECTIONS in the protocols section on Care and Use of the Microscope. Don't get oil on the other objectives. If spores are present, and the stain is successful, this is a beautiful stain. The spores are bright green and the vegetative cells are red. Malachite green stain: 5% aqueous. Dissolve 5 g of malachite green in 100 ml distilled water. Safranin (not Gram's safranin): 0.5% aqueous. Dissolve 0.5 g safranin in 100 ml distilled water. This page was last edited on 2 April 2012, at 10:44.